Есть ещё три страницы текста и парочка контурных рисунков гусар. если надо - пожалста! Есть серия статей из журналов Military Modelling по униформам войны за Испанское наследство. Рисунки в тексте, как их выделить - не знаю. К тому же, в тексте и описания униформ. Если устроит в таком виде - продолжу выкладывать. Если нет - удалите. 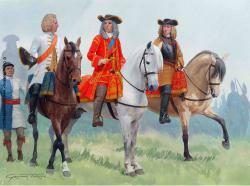 One of the great military partnerships in history began on 10 June 1704, when the Duke of Marlborough and Prince Eugene of Savoy met for the first time in Mundelsheim, a small village near Stuttgart. Just over two months later the two commanders spent the early morning of 13 August planning their attack against the Franco-Bavarian army encamped near Blenheim. Shortly before 7.00am they rode past the village of Wolperstetten to peer through the morning mist at the enemy, who occupied the high ground on the far side of the Nebel stream. They were accompanied by Major-General Natzmer, the commander of the Prussian cavalry, whose experienced eyes confirmed that the slope in front of them was suitable for cavalry, if only the Allied horse were able to cross the stream. This view of the scene shows Marlborough in the centre, with Prince Eugene on his left listening to Natzmer's appreciation of the terrain, which was delivered in broken French. Behind Marlborough stands one of his messengers, wearing a distinctive jockey cap and blue-and-white livery. Shortly after 7.00am Prince Eugene and Natzmer rode off towards the west, leaving Marlborough to supervise the final deployment of the Allied left wing. During the battle of Ramillies, the Allies spent the early afternoon launching infantry attacks against the French flanks, while in the plain to the south of Ramillies the main cavalry forces of both armies remained stationary. It was after 3.30pm when Marlborough finally unleashed his cavalry, and soon the ground to the south of the village was a swirling mass of horsemen. The French soon rallied from the Allied assault, and their counter-attack - spearheaded by the elite Maison du Roi - drove the Danish and Dutch horsemen back in confusion. Marlborough ordered his cavalry reserves forward, and to win time for them to arrive he rode forward, hoping to rally his flagging troopers. Instead he was knocked from his horse, and for a few minutes he was in grave danger of being killed or captured. 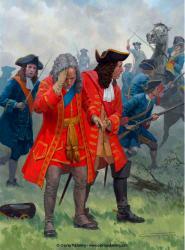 A quick-thinking Dutch commander ordered a regiment of Swiss infantry to advance to protect the Allied commander, while Captain Molesworth of Marlborough's staff helped his shaken commander to his feet and led him to safety behind the Swiss line. 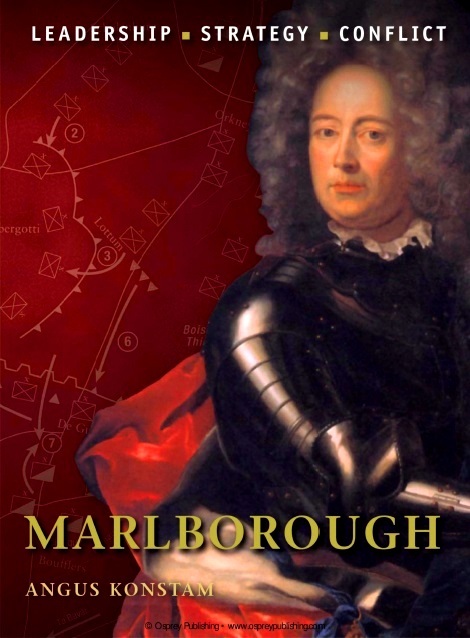 A fresh horse was found, and minutes later Marlborough was back in the saddle, directing the cavalry reinforcements whose arrival turned the tide of battle. Marlborough's plan at Malplaquet was similar to those that had brought success at Blenheim and Ramillies. He launched attacks against the enemy flanks, hoping the French would strip their centre of troops to reinforce their threatened line. At the critical moment he would unleash his reserves against the French centre, hoping to achieve a decisive breakthrough. 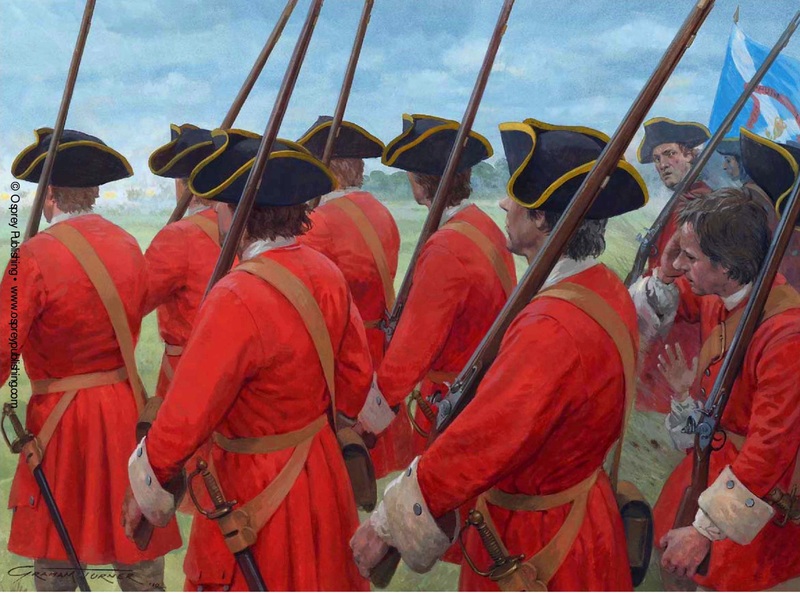 At Malplaquet this reserve consisted of 15 battalions of British and Hanovarian infantry, under the command of the Earl of Orkney. These men had to endure intermittent French fire for most of the morning, but at 11.45am Marlborough finally ordered Orkney to advance, and his infantry advanced steadily, succeeding in driving the French from the redoubts that marked the enemy line. The way was now clear for the Allied cavalry, who passed the redoubts to engage their French counterparts. Eventually, numbers began to tell, and by 2.00pm the French retired from the field. In this spirited scene Orkney's British infantry - Scottish soldiers of Orkney's own Royal Regiment - have just begun their steady advance towards the waiting French. In Marlborough's time a British battalion of around 500 men was deployed in three ranks, allowing the whole battalion to fire their muskets at the enemy. 1. Бленхейм, 1704 г. Французские мушкетер и гренадер. 2. Поход герцога Мальборо на Дунай, 1704 г. Английская гвардейская пехота. 3. Австрийские мушкетер и гренадер. 4. Голландские мушкетер и гренадер. ВИЖ 1991 г. №1. Форма одежды Московского гренадерского полка 1799 - 1800 гг. Продолжаем тему армии Павла I (благо богатая иллюстративным материалом). В данном случае - виды некоторых униформ, носимых старейшими полками русской гвардии в недолгое царствование этого императора. Продолжаем Павла. Верхняя одежда военных его эпохи и эмигрантский корпус принца де Конде в России. 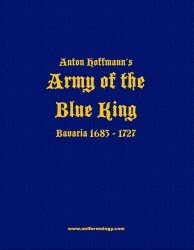 Army of the Blue King. Army Of Spain In The New World And Napoleonic Wars 1740-1815.